Mechanical Systems Play a Critical Role in Making a House Comfortable. Comfort is the most subjective quality of home building. Different people offer different judgments of the same room at the same time. Air temperature, mean radiant temperature, relative humidity, and air movement all play a part, but bases its comfort standards on two things: temperature and humidity. Moreover, people’s comfort ranges vary during the course of a year. A comfortable thermostat setting during winter (65°F) might feel much too cold in August. Because of comfort’s subjective nature, ASHRAE’s comfort standards aim to keep about 80% of the population happy. Controlling the indoor temperature isn’t enough to make a house pleasant. The HVAC system plays a crucial role in controlling temperature and humidity. Heating and air conditioning obviously affect the temperature, but it’s important not to overlook ventilation. The first goal of ventilation is to control moisture and odors at their source with properly-sized exhaust fans in bathrooms and kitchens. A humidistat or timer rather than a switch ensure that fans run long enough to expel humid air. The second goal of ventilation is to regulate the fresh air (measured in air changes per hour, or ACH) in the house. A mechanical ventilation system also exhausts humidity from people breathing and perspiring, but during the summer it can also bring outdoor humidity into the house. 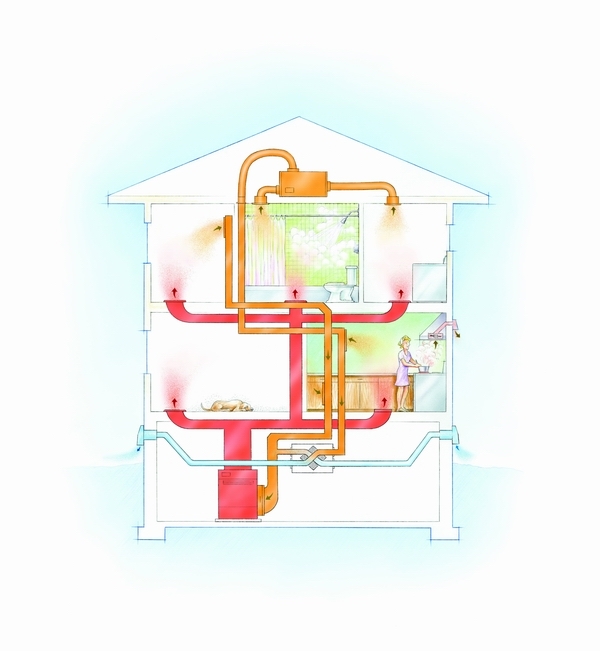 Energy-recovery ventilators transfer humidity between two air streams: the incoming fresh air stream and the stale exhaust air stream. Humidity moves from the more humid air stream to the dryer air stream. The right mix of temperature and humidity is a health issue and a comfort issue. Relative humidity (R.H.) is the amount of water vapor in the air as a percent of the total amount of moisture the air can hold at that temperature. When R.H. reaches 100%, condensation occurs. As temperature rises air can hold more moisture, as temperature falls the air can hold less moisture. When warm, moist air contacts a cold surface, the air cools, and at this lower temperature the air cannot support as much water vapor so condensation occurs. If humidity levels are high enough, fabric, paper-faced drywall, and wood can all support mold growth. As a rule, R.H. should be kept below 70% because that level can support mold, corrosion, and dust mites. But it’s important to consider where the R.H. is measured. The R.H. in the middle of a room will be different than the R.H. on the wall and window surface if there is a significant temperature difference between the two. Because of the big temperature differences between inside and outside of a wall, it’s easy for the inside surface of a wall to feel a little cold. The colder it gets, the lower the indoor R.H. must be to prevent the dreaded 70% R.H. on windows. Green homes in cold areas boost their levels of insulation and control humidity with ventilation. Rigid foam wall sheathing helps keep wall cavities warm, reducing the possibility that moisture will condense inside wall cavities. When hot outdoor air is cooled by an air conditioner, the R.H. goes up. Fortunately, an air conditioner’s cooling coil acts as a dehumidifier. Nevertheless, a poorly designed air conditioning system with leaky ductwork can pull moisture into a house. In depressurized leaky houses, moisture can be sucked in through cracks in walls and floors. In green houses, however, air movement is more controlled and predictable. In an air-conditioned home, mold can take hold on the back side of drywall if humid air gets inside the wall and condenses on the cool inside wall surface. Wall coverings, especially impermeable ones like vinyl wallpaper, can trap condensation and create mold problems. 5. Avoid plastic vapor barriers and vinyl wallpaper if you air condition. 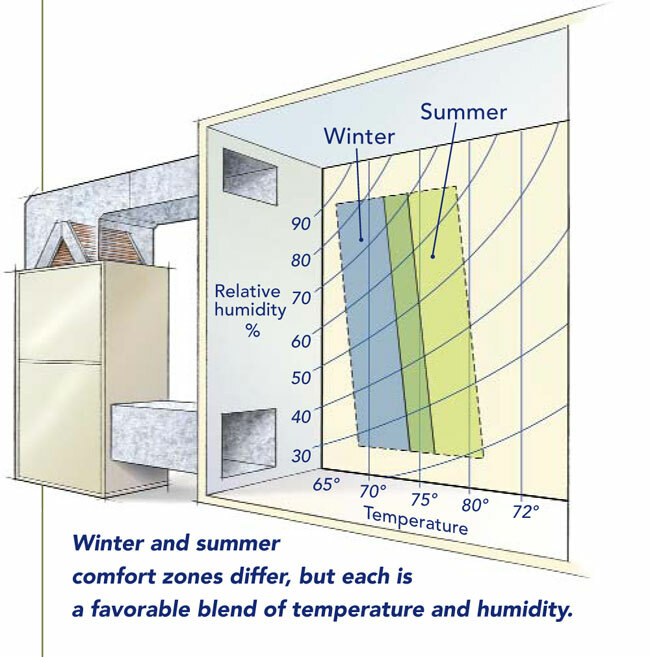 The building envelope plays a critical role in comfort. Drafts will leave people feeling cold in the winter regardless of the thermostat setting. To limit drafts, a home requires an effective air barrier. Air barriers usually fail where two dissimilar materials meet: for example, between a concrete foundation and the mudsill, between a rough opening and a window frame, or between a subfloor and the bottom plate of wall. Other problem areas include interior kitchen soffits along exterior walls; walls behind bathtubs on exterior walls; cantilevered floors; and fireplace surrounds. After the installation of air barrier materials, caulk, and strategically placed spray foam, but before the installation of gypsum wallboard, every house should be tested for air leakage with a blower door. Preventing air movement in the walls is also important. While popular and relatively cheap, fiberglass insulation is the worst performing insulation choice because it leaves plenty of gaps for convective air currents within the wall assembly. In a home lacking an effective air barrier, warm air can contact cold surfaces inside a wall, leading to condensation. Spray foam and dense-packed cellulose insulation are more effective at reducing air infiltration than fiberglass batts. Windows significantly affect occupant comfort. During the winter, the interior face of window glazing is almost always the coldest surface in any room. Whenever the temperature of the widow glass is lower than human skin temperature, our body heat will radiate towards the windows, giving us a chill. Efficient windows with low U-factors are less susceptible to condensation, something of a litmus test of their comfort because condensation only occurs when air at the window is cooled to its dew point. Windows with a low U-factor also stay warmer during the winter, reducing the radiant cooling effect. U-factor isn’t the only performance measure to use when selecting windows. Rather than taking a “one-size-fits all” approach when specifying the solar heat gain coefficient (SHGC) of windows, tune window performance by selecting different SHGCs depending on the orientation of each window. Use low SHGC values to reduce solar heat gain on west- and (in some climates) east-facing windows and high SHGC values take advantage of solar gain from south-facing windows to warm the house. There’s another way windows can help keep a house cool without resorting to air conditioning: placing operable windows low on the windward side of the house and higher on the leeward side encourages cross ventilation and encourages convective cooling. Low-e coatings improve the comfort and efficiency of double- and triple-glazed windows by lowering a window’s U-factor. Low-e coatings reflect heat back into the house during cold weather and back to the outdoors during warm weather — increasing the insulating value of the window. A low-e coating is a microscopically thin, virtually invisible, metal or metallic oxide coating deposited on a glazing surface. The coating may be applied to one or more of the glazing surfaces facing an air space in a multiple-pane window, or to a thin plastic film inserted between panes. Argon or krypton gas is often added to the space between panes in low-e windows because they are better insulators than air. Feeling comfortable isn’t about temperature only. It’s about a favorable blend of temperature and humidity. And of course, what’s just right for one person may not be just right for another, so comfortable becomes a range. That comfort zone is somewhere between 68°F and 78°F with relative humidities ranging from about 25% to 65%. To remain in the comfort zone as temperatures go up, relative humidity must go down. Even though most of us can sense changes in temperature of 1°F to 2°F, we are less sensitive to humidity. Levels between 25% and 65% feel about right. According to ASHRAE, less than 25% relative humidity can lead to dry nose, throat, eyes, and skin. Greater than 70% can lead to mold, corrosion, and decay. High relative humidities in carpet and within fabric can lead to dust-mite infestation and mildew (mildew is mold growing on fabrics). For any given individual, there is a range of temperatures and humidity levels within which the person feels comfortable. These ranges vary from individual to individual; they also vary from country to country. In the 1950s, Americans visiting Europe were often surprised to learn that central heating was rare in Britain. As temperatures dropped, Britons reacted by putting on a sweater and brewing a cup of tea, and waited far longer to turn on a space heater than American visitors thought reasonable. In a passive solar house, daily temperature ranges can be wider than some people are used to. As long as thermostats aren’t set to keep the interior space in a very narrow range, a passive solar house might be 60° F at dawn and 79° F at 2 p.m. A wide temperature range improves the performance of a passive solar house, since efficient storage of solar heat requires that the house have a low starting temperature in the morning. If homeowners can adapt to wider comfort ranges, their energy bills and environmental impact will be lower. Homes with a heat-recovery ventilator (HRV) exhaust stale air from bathrooms and the laundry room while providing a measured amount of fresh air to living rooms and bedrooms. The HRV has a heat-exchange core; in winter, the unit recovers some of the heat from the exhaust air and transfers the heat to the incoming fresh air stream. A tightly sealed home without mechanical ventilation can be smelly and humid. When air is stale, everyone reacts the same way: it’s time to open a window. But if the outdoor temperature is 10° F, opening a window quickly makes occupants uncomfortable. If a house has a properly designed and functioning mechanical ventilation system, the air should stay fresh with minimal occupant intervention. Clearly, too little fresh air is a problem. But overventilation should also be avoided, since the operation of a ventilation system always carries an energy penalty. In winter, outdoor air must be heated, and in summer, outdoor air may have to be cooled and dehumidified. The solution is a mechanical ventilation system that brings in a small amount of ventilation air — just enough to prevent smells and humidity problems. When choosing between high and low indoor relative humidity, it’s always safer to choose lower humidity levels. Far more problems are caused by humidifiers than dehumidifiers. A well designed home should not need a humidifier. Very dry indoor air during the winter is usually a sign that the house has too many air leaks. When air leaks out of the house through ceiling cracks, it’s replaced with very dry exterior air entering through cracks at the mudsill and basement rim joist. Installing a humidifier in such a house can lead to disaster. If the indoor relative humidity is raised, moisture can condense on cold surfaces inside the walls or the attic, leading to mold and rot. If air sealing work is performed in the attic and basement, the indoor relative humidity will rise — without increasing the risk of rot and mold. There are at least eight places for air to leak through this part of a floor assembly. Redundancy in preventing leaks is the key to success. 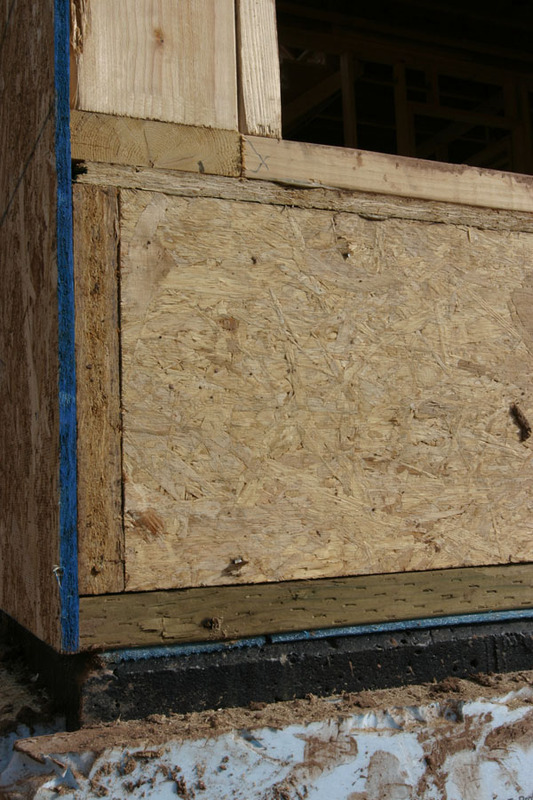 Here, subfloor adhesive, gaskets, and bridging the gaps with sheathing are all used. Some older houses leak so much air that occupants are made uncomfortable in winter by cold drafts under doors, through windows, or even through electrical receptacles. Air leaks in newer homes are often more subtle. Because modern exterior doors and windows include better weatherstripping, occupants may not notice drafts. But large volumes of indoor air may still be escaping into the attic through cracks in the ceiling, while outdoor air simultaneously enters the basement through cracks under the mudsill. Improving the home’s air barrer will plug these hidden air leaks, lowering heating and cooling costs. When a drafty home is sealed, the reduction in the home’s air exchange rate leads to a rise in indoor relative humidity during the winter, improving occupant comfort. In many homes, the windows are the most important factor affecting a home’s cooling load — far more important than the home’s insulation levels. A room with large windows facing west will be very hot on summer afternoons, especially if the windows have ordinary clear glazing. If the HVAC installer properly anticipates this problem, the room can be served by a powerful air conditioner connected to high-capacity ductwork. Although this “solution” may keep occupants comfortable, they won’t be happy with their electricity bills. In some climates, reducing the size of west windows may be necessary. In a hot climate, west windows should be ordered with low-solar-gain glazing. Planting trees on the west side of the house can provide shade. LEED-H EQ3 (Environmental Quality) offers 1 point for active dehumidification; EQ6 up to 3 points for space conditioning distribution strategies that enhance occupant comfort. NGBS Under Chapter 9, “Indoor Environmental Quality”: up to 8 points for active dehumidification (903.7); whole house ventilation (902.5). Under Chapter 7, “Energy Efficiency”: various points for ceiling fans, good duct design, low-e windows (703 & 704). I've not read the entire article but knowing your company and the information you provide, I'm sure it's complete and functional. One thing that causes me great anguish is many buildings have little to no roof overhangs at windows. I'm talking about roof overhangs that keep the direct solar gain to a minimum during the summer months but provide optimum solar gain during the winter. With windows, I would prefer to get as much solar gain during the winter for additional heating and Low-E minimizes that gain keeping the heat in and lessening solar gain. AND during the summer when it's inclement weather, many times the windows must be closed to prevent water intrusion because there are insufficient roof overhangs. I see homes with casement windows that when partially opened extend beyond the roof overhang. These windows can NOT be opened during rains. Keeping windows open during spring, summer and fall as much as possible will minimize mechanical cooling. The high and low windows on the windward and leeward sides of the building, stack effect, etc. will only work with functional roof overhangs to extend and invite the outdoor environment indoors... thus reducing the need for air-conditioning. Thanks for offering me the opportunity to rant. Thanks Dave, for the rant. Furthermore, no eaves or rakes are PUG-UGLY, imho. And what manner of creatures are we becoming if we no longer desire any direct connection with the outdoor environment? Windows closed 24/7/52? Ee-Yuckh! Don't get me started. This is a subject drum that needs banging on, long and hard. Wish I'd seen this when you first posted. if the outdoor air is not polluted with all manner of neighbors' smoke, herbicides, car exhaust, cow urine, weed smell and pollens.